Kav and Tony Break It Down has returned! Consider it a late Christmas gift from Champion City Comics. We will be reviewing Superman #171 which featured the story 'The Curse of Magic'. The writer was none other than Jerry Siegel, the penciler was the legendary Curt Swan, and the inker was George Klein. Enjoy! KAV: Ok, here we see Superman acting as a sort of general handyman for the people of Metropolis. Maybe he should see if there are any life/death situations in OTHER CITIES once his 'chores are done'. We see Mr MXYVDYTFHGJX (or whatever) informing Supes that everything he says will come true. Easy solution? Just don't talk. Possible for Stuporman? Nope. TONY: You know it is going to be a doozy when Mr. Mxyzptlk, the silly sprite from the fifth dimension, is the featured villain. 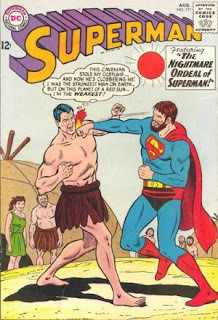 And how does Superman always defeat this dastardly villain? He has to make him say his name backwards. Lame. 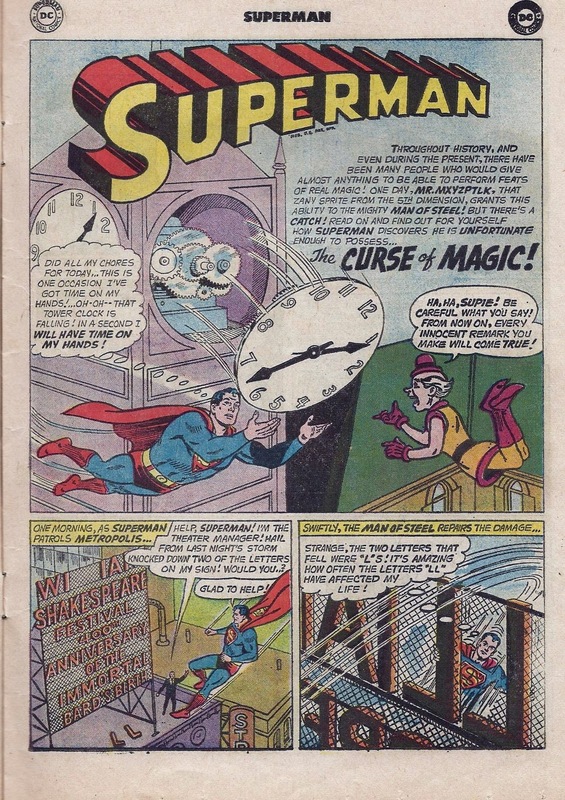 The first panel has Superman thinking about time on his hands and the face of the clock falls. Mr. Mxyzptlk says, "Be careful what you say!" OK, he THOUGHT about time on his hands, so why did the face of the clock fall? He did not SAY ANYTHING! Come on, Siegel. KAV: Perry sends Lois and Clark to Smallville to come up with an interesting story. They uncover the amazing facts that he helped Chief Parker and the dude living in Luthor's old house isn't upset about it. This is Pulitzer level stuff Perry-good call. 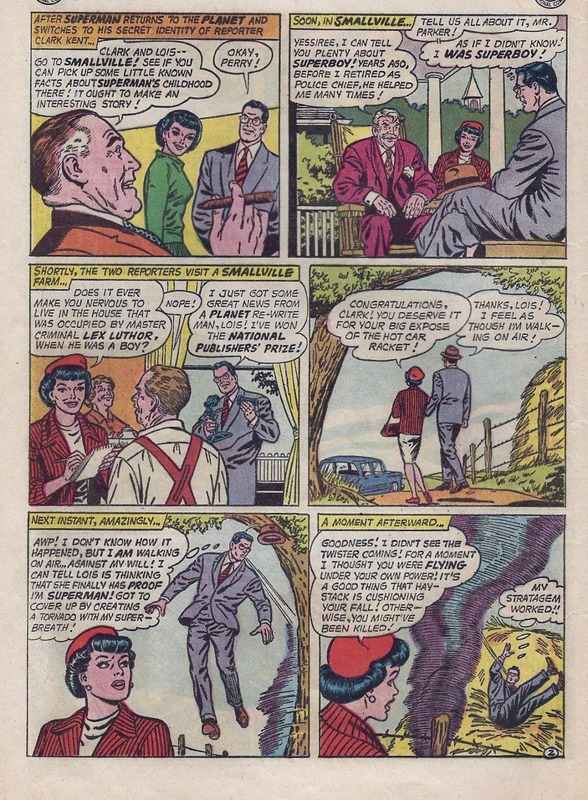 Clark mysteriously starts levitating but in order not to make Lois suspicious that he's Superman, he whips up a mini tornado to explain his floating. That he was floating before the tornado doesn't faze him. TONY: Lois and Clark travel to Mayberry to dig up dirt on Superman. Those two are no TMZ. Did Clark really get a call from a Planet re-write man on winning the National Publishers' Prize or was he scammed by some dude in Nigeria? Two pages into the story and Siegel has taken liberties with the power of the human breath and weather. Superman can just whip up a tornado with his breath? If that were the case then he'd kill people if he sneezed. Just stating some facts, folks. 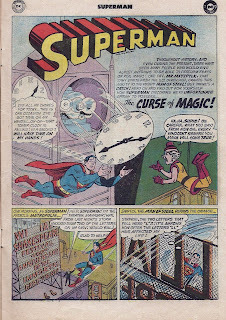 KAV: This is a real doozy-for the first time in the DC Universe they changed the rules about Mr MXYRHYFUFUFUGX's (or whatever) magic which usually disappears when he does, but the writer was too lazy to handle two plots in one story so they just had him voluntarily leave our dimension so Stuporman wouldn't have to come up with a clever way to make him say his name backwards. Then Supie says he's as hungry as a horse and of course a horse appears (hey wait-shouldn't Supie have turned into a horse? Anyway). This completely ruins the dinner party, as we learn in the next panel. 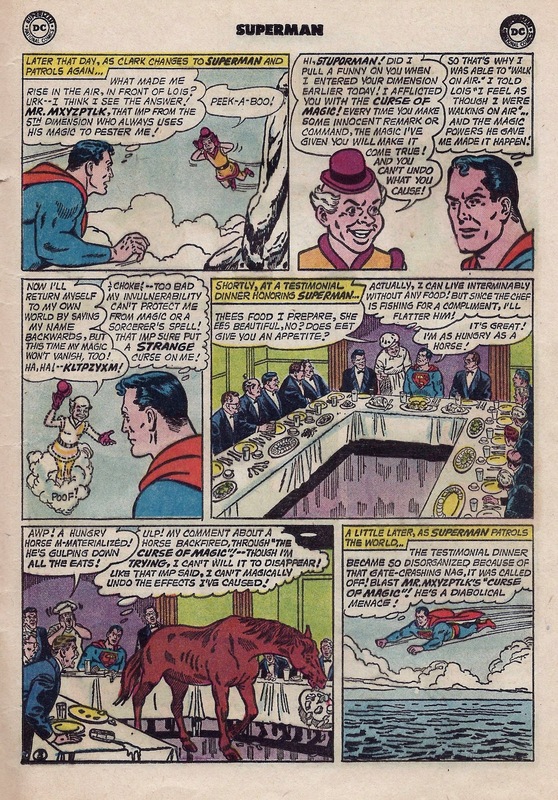 Apparently even Superman, with all his powers was unable to get rid of a HORSE so the dinner could continue. Maybe he should have called in the Justice League. All together, they might have been able to get rid of a HORSE. TONY: Did someone have a horse problem? Click here to see how you take care of a horse, Superman. You're welcome. STAY TUNED AS KAV AND TONY BREAK DOWN MORE PAGES!